Arsenal are through to the semi-finals of the FA Cup, where they will face Chelsea, following their 2-1 win over Hull last night. Despite comprehensively dominating the game, Arsenal relied upon a controversial late goal to progress. William Gallas was clearly several yards offside before he scored, yet amazingly the linesman failed to spot it. In the interview following the game, Hull boss Phil Brown claimed that Cesc Fabregas spat in the face of Hull assistant boss Brian Horton. StenhousemuirRed you asked for evidence that Ballack quote denying Fabregas spat on him..so i ask u prove to me that Ballack quote Fabregas DID spat on him..
My fellow gooners cant prove that Cesc did not spit at Ballack but i can. 1. Ballack did not react when Cesc "spat" at him. 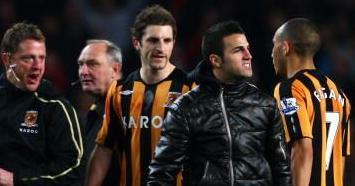 2.No one claimed that Cesc spat at Ballack. Not the manager and certainly not Ballack. 3. No action was taken by Uefa. 4. The ref gave a yellow card for the tackle, not for spitting. Now i know that even Mancs arent dumb enough to think that Uefa will take no action what so ever against a player, playing for an English team spitting at a German player. well marq if you believe what you see, then it proves that you are a dumbass..did you see any spit coming off from Fabregas mouth?? i certainly not as does everyone else, and if you believe what you see, surely you must have some concrete evidence eg; Ballack/the referee/UEFA/Bayern players and staffs quoting that Fabregas DID spat on Ballack..
there's no quote which says Fabregas DID/DID NOT spat on Ballack, so your arguement don't hold any water..if you're able to prove it to me then i will say without a doubt that Fabregas is a liar, as he said he never spat on anyone before..but if you can't prove it to me, then stop wasting your time posting comments and do something beneficial for everyone's sake..
you're innoncent until proven guilty not the other way around, that goes to all ManYoo fans and the blogger in particular..
Why would a football man like Brian Horton claim Fabregas spat at him if he didn't?
" he get so close to Ballack’s face and then actually do a motion WHICH SUGGESTS he spat at Ballack, i.e. his heard jerking forward"
there you have it "WHICH SUGGESTS", not a strong enough claim ain't it?? and don't go about saying Ballack's reaction you dumbass..
well jake if i were to lean my head towards you and shout at you, wouldn't you have recoil?? well that's what our instinct reaction would have been wouldn't it?? like what i said earlier unless you can prove to me there's a quote somewhere where Ballack/the ref/Uefa/Bayern players and staffs said that Fabregas did spat on Ballack then i wouldn't say Fabregas is a liar..
jake if my english is not up to par then pardon me coz it's not my mother tongue..Look here moron the video above is inconclusive, and like you said his action ie; head jerking forward is open to accusation..accusation which could prove him guilty or otherwise, if he's guilty then he's a liar right?? and what if he's innoncent, do you still call him a liar or unlucky?? idiots like you see what you only want to see..you're English aren't you?? surely you must have heard something like "a picture tells a thousand words"..
like i said earlier if there’s a quote somewhere where Ballack/the ref/Uefa/Bayern players and staffs said that Fabregas did spat on Ballack then i'd agree Fabregas is a liar..clearly you've never been to court jake, coz if you want to prosecute an accuse, you have to have evidence and witnesses not educated decision like what you said you have in abundance..my guess is if you're a lawyer, your case would have been thrown out of court as it's based on educated decision not evidence and witnesses..
now go on and look up for the quote and counter my points..my stand is Fabregas is not a liar as there's no substantial evidence to prove that he did spat at Ballack..
hey moron 'a picture tells a thousand words" also clearly back up my point you idiot..it may seems he spat at Ballack and it also seems he hurls abuse at Ballack..i'm so disappointed in you jake, English is your mother tongue but you only seems to see it in only one perspective..with regards to the video being your evidence,it is inconclusive..here's a quote from an article i believe you haven't see..
"the entire incident was seen by the match official, and Fabregas was booked, indeed in his match report the referee cited the yellow card was for yelling abuse at Ballack.No complaint was ever made by Micheal Ballack or Bayern Munich, and now BM director of communications, Markus Hoerwick, has come to the aid of Fabregas claiming 'It definitely never happened. If anything of that kind happened I would have been the first to be informed and the first to do something about it.' "
there you have it case closed..it's better talking to a stupid person rather than talking to someone as a stubborn little prick like you.